Is your Facebook timeline filled with Sarahah links with people asking you to give honest feedbacks about them? Want to know how this new viral app actually works and if you really want to use it? Then read the article and get answers to all your queries about this app. There have been difference services in the past which allows us to send anonymous texts to people who voluntary ask for it. Similarly, there is one new app in the market right now which is becoming quite viral on Facebook right now and its name is Sarahah. Sarahah has been developed by a developer from Saudi Arabia and in Arabic, Sarahah means honesty. It works as a service where you need to make an account after which you will get an ID which you can share with anybody online. People will be able to use that ID to send you messages without themselves registering for the service hence the identity of the receiver remains unknown. Your admirers can send you nice messages and your haters can send you abusive messages. You cannot reply to the messages since even people who don't have an account can message you. However, you can block particular senders by clicking on the block button in the message. You also have the option to share the message on any social media, mark the message as favorite or report the user. There are 3 sections in the app - the messages you have marked favorite, the messages you have sent and the third one will show all the messages you have received expect the ones you blocked. You can also search for users, edit your profile to add a profile picture or change settings, share your profile URL on social media and an Explore option. However, the Explore option is still under development and you will see a coming soon message there right now. You can use Sarahah directly from your browser. Just go to Sarahah.com and sign up there. Otherwise, you have apps for Apple and Android phones too. Windows Store has Sarahah apps too but they are unofficial apps showing you the web interface only. Just because of the nature of this app where it allows people to message you anonymously you can become a victim of cyber bullying. People can start abusing you, shaming you and what not. 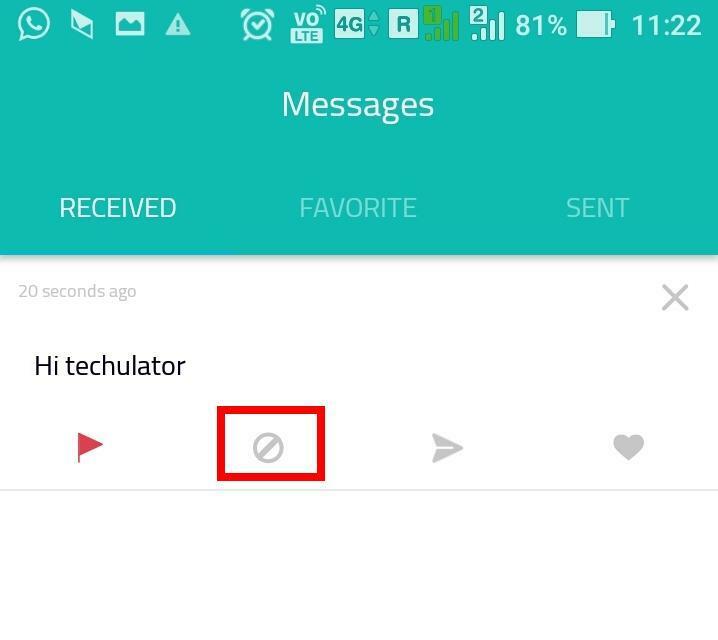 So the question arises now is how to block such users on Sarahah. Even though people sending you messages are anonymous, you can still block such people by using the block button present on the individual messages. Once you block someone there don't look like a way to unblock them. However, if you allow people without Sarahah account to message you, there are ways to circumvent the block just by using another device on another IP to message you. However, the message sender won't know you have blocked them, therefore, they can in vain keep sending messages whereas you won't be receiving them. If it gets too bad then you can simply remove your account from showing up in in-app searches and block unauthorized users from messaging you. Sarahah reminds me of our college "Confession" page. Initially, there was a lot of hype on that page with anonymous messages being made public and messages of love, hate and infatuation hogging the attention of the whole college but slowly the interest fizzled out and within a month nobody was even bothering to open the page. Same is the case with this app, it has gone viral on Facebook right now and will probably stay viral for some time. However, if you like me are not much fascinated by the idea of receiving anonymous messages without any accountability then you won't be missing out on anything but not using the app. The peace of our life is more important than the thoughts of some acquaintance who holds a secret grudge against you. Appears to be a strange platform where no one knows any one but communicate and exchange everything which each other. Due to privacy and anonymous status people may use this app but in long run if someone gets abuses and other offensive material he may discontinue to use it. Anyway only in future we will be able to find out the fate of this app.